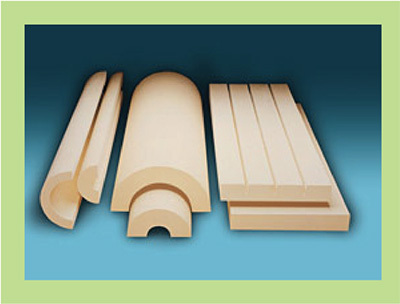 calcium silicate, and which usually contains reinforcing fibers. types, classified primarily by maximum-use temperature and density. the operating temperature between 80° and 1,700°F. fitting block to large-diameter curved surfaces. as valve or fitting insulation, can be fabricated from standard sections. and Type II is 0.50 Btu-in/(h?ft²?°F) at a mean temperature of 100°F. boilers, vents, and exhaust ducts.